One of our Signature Events, Book Paper Scissors is an annual celebration of book arts, printmaking, and paper crafts, hosted by the Free Library, and featuring a variety of artists as well as educational workshops. Just in time for holiday shopping, Book Paper Scissors brings you an array unique wares! Local and regional artisans will set up shop for this one day in the Central Parkway Free Library, to offer handcrafted fine and decorative arts to suit almost any interest. 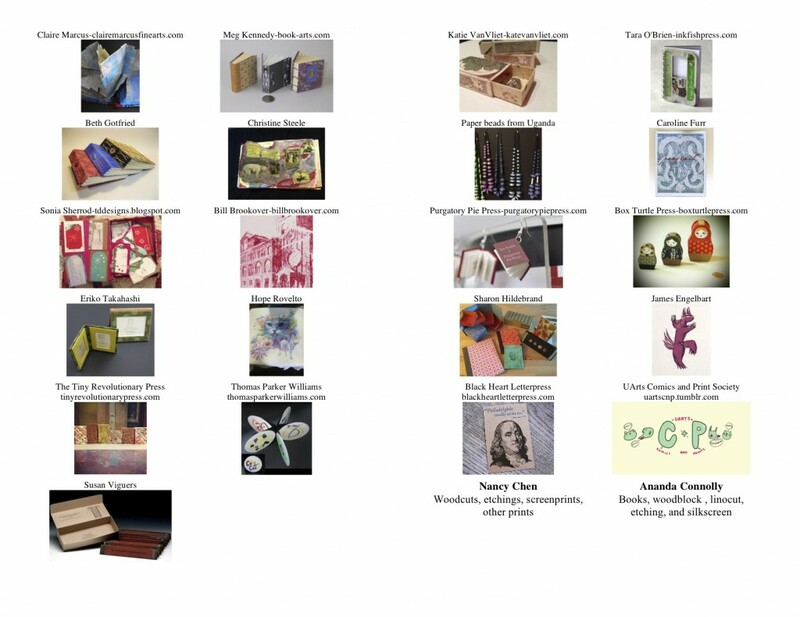 Find custom jewelry, limited-edition prints, handmade paper, beautifully bound books, and more! Do you enjoy reading books and making up your own stories? Come spend an hour and learn how two variations of your own books, the Accordion Fold and a Pamphlet Stitch Book by folding & gluing paper and sewing with yarn. Spend the rest of the hour filling the pages with stories and pictures inspired by the upcoming holidays. Erin Malkowski is a book artist, printmaker, and graphic designer currently living in South Philly. Malkowski is the Assistant Book Conservation Technician for the Rare Book & Manuscript Library at University of Pennsylvania, Project Conservation Technician at the Historical Society of Pennsylvania, and an instructor for the Museum Studies Graduate Program at University of the Arts. Malkowski has exhibited nationally in North Dakota, Minnesota, Texas, Tennessee, Colorado, and Pennsylvania. She is currently exhibiting in Paper Works: Philadelphia Center for the Book Member Exhibition at the Art Dept. in Fishtown. Flag books are easy to make but have a wonderful pop-up-like action when they open. They are versatile for photo albums, gifts, cards and artist books. This form was invented by book-conservator Hedi Kyle. Great fun for makers of all ages. Esther K Smith is author of HOW TO MAKE BOOKS and artistic director of Purgatory Pie Press she makes artist books and limited editions, collaborating with founder Dikko Faust and other artists and writers. Faust hand-sets wood and metal type and prints on a Vandercook letterpress. International museum collections include MoMA, the Whitney, the Brooklyn Museum, and Cooper Hewitt Design Museum. Smith also wrote MAGIC BOOKS & PAPER TOYS and THE PAPER BRIDE, and wrote the forward for LITTLE BOOK OF HANDMADE BOOKS. She is working on a book about making books with kids.